Skiing - What we really love to do! Since the bulk of this page was written, we've been back to Canada for a second time, including an exciting day heliskiing for me. Overall, the snow wasn't as good as our first trip (but still excellent by frequent standards in low lying Europe), but the weather was much kinder and Lauren really enjoyed the skiing and child care facilities there. Once again Banff was it's welcoming self and we all had a great 11 days. We've also spent two holidays in France (in 1999, when the snow was so plentiful) and I've decided to add these holidays as seperate pages for Flaine and Avoriaz. In 2000, we left booking our skiing holiday very late. In the end, and with School holidays an issue, we booked a week in Killington, Vermont. Killington is an unusual ski experience. Some people I know have commented it is a bit like skiing in Scotland. The hills, they are not really mountains, have a good variety of skiing, with steep pitches for experienced skiiers and gentler slopes winding around them for less able skiers. We all went to ski school in Killington and it was excellent. Lauren, probably helped by the common language, came on in leaps and bounds and Mandy and I both found the ski school challenging and enjoyable in equal measures. On the downsides, Killington is not really a developed resort. We stayed some way away from the slopes in another town, where restaurants closed at 8 PM. Our motel was basic, although there was an excellent breakfast place directly across the road. Also, on our last day, it POURED with rain, which it is prone to do, due to the low altitude. We still have not skied in the more mainstream resorts in America, but people who have, have aimed the same criticisms of undevelopment on the slopes at them. On the mountain, there is virtually nothing. On the whole, we DID enjoy Killington, mainly due to the short, but enjoyable pistes and the excellence of the ski school. That said, we have never felt an uncontrollable urge to return. 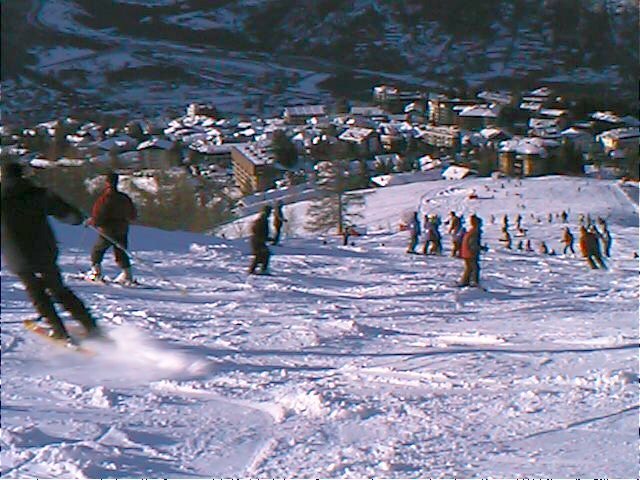 For 2001, we booked a week (against my prejudices about the place) in Sauze D'Oulx, Italy, at New Year. The flight wasn't too bad (as I recall 2 years later), but, despite the Rep's suggestion that we might get to ski in the afternoon of our arrival, we had to queue for the hotel check-in, skis vouchers, ski fitting - basically EVERYTHING. Fortunately, we have our own skis, but Lauren needed rental skis and the ski hire shop (Besson) tied to our operator dispensed ancient equipment at near top rate prices. We had a lengthy 'discussion' with the 'technicians' (who I can honestly say knew less about fitting skis than me, and I don't claim that's a lot!) about the need for Lauren to have poles which were shorter than she was tall! Oh well, we thought, Italians are friendly, relaxed people, perhaps the shopkeepers are nicer - We bought a cheap item in Faure sport, which was broken when we examined it back at the hotel, so we returned it the next day. Our reward for this was to suffer anti-English abuse, from the elderly woman who ran the shop, when we refused to accept the problem was our fault(Mussolini is alive and well, it seems!). Once we got skiing, things didn't get any better. Connections to Sestriere, Sansicario, etc were hardly ever open and NEVER guaranteed - If I took a lift out of the direct Sauze area, I might find myself with an expensive taxi ride back, with no public transport option. The Milky Way, it seems, is not an area, but lots of areas, occasionally, it is rumoured, joined. Even the local ski buses were over-full and ran infrequently, meaning it was often easier to walk to the slopes, even though they were some way away. 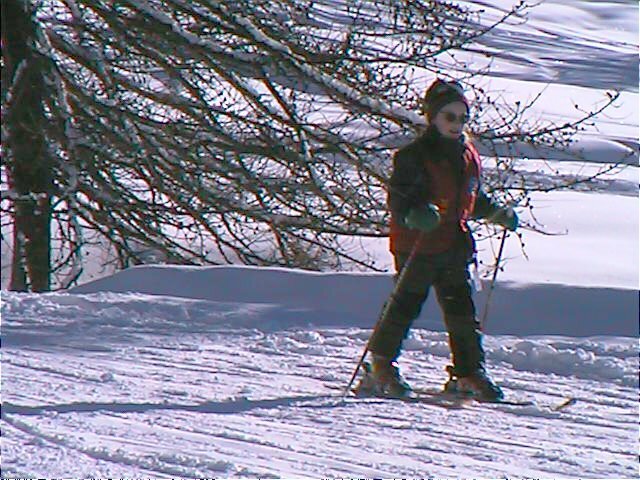 Lauren went to Ski school, but it was only available for all days or for private lessons only and it only offered half days so there was no way to leave kids for the day and explore area. 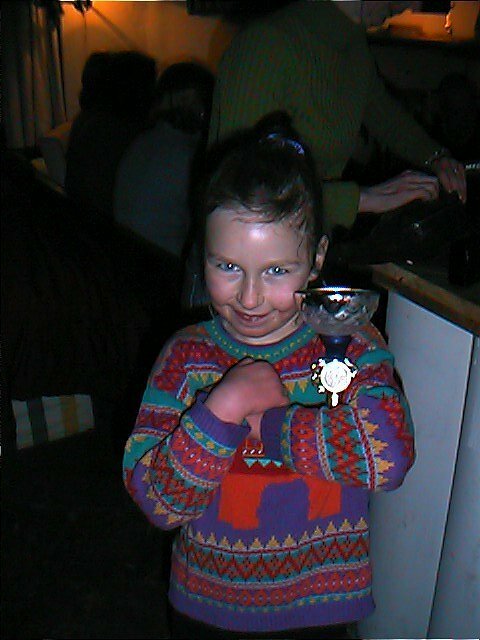 Overall, though she seemed to enjoy ski school, especially the end of week race, where here 3rd in her class netted her an absurdly grand trophy - Still it got her lots of attention at the hotel and on the way home and takes pride of place at home. Many of the lifts (especially Clotes) are antiquated and randomly opened with poor information on which were open or closed. More than once we had to walk 1/2 mile or so to get from one closed lift to a piste or another lift. On the positive side, Food and drink was fairly priced and of reasonable to good quality (in our experience). Scacco Matto, Chalet Clotes, Pizzeria on 2002 being the best we found on slopes and, in contrast to the town's shopkeepers, most restauranters were fairly friendly. Another point, although I'll admit this is partly due to my ignorance - for a resort popular with the British, there's little signage in English (but bus drivers, lift operators, etc will shout at you should you make an honest mistake). Unlike French or German, written Italian offers little clue to the meaning for English people. OVERALL: Sauze is a badly outdated resort with decrepit facilities . Some shopkeepers seem to see English people as rich pickings who are deeply unwelcome - My advice, spend your money elsewhere and be treated with some courtesy (Bardonnechia was full of delightfully friendly people). The skiing is ok (no more), but the aggro doesn't justify it! The worst skiing holiday I've ever had? If not, it comes very close. 2002 saw us return to Avoriaz, where Mandy and I had spent a very pleasant week in 1999. This time, we drove down to spend a week in a chalet with 3 other couples and their (younger) children. The drive was not too stressful, splitting the driving between us, and we arrived in Avoriaz at 11AM, in plenty of time to buy some half day lift passes, rent Lauren some skis and do some gentle skiing. We changed Lauren into her ski suit, but decided we were capable enough to ski in jeans and normal jackets. This would have been a reasonable presumption, except that it started to snow. Wet, heavy snow and within half an hour our jeans were soaking wet. The friends who had booked the chalet live in Geneva and suggested they'd be in Avoriaz by 5. By 6 we were cold and wet, so we managed to persuade the agency to give us the key and we got into the chalet, just as the second couple arrived. The chalet was lovely, perched right on the top of Avoriaz, where the ski school meet and overlooking the run towards Morzine. This was true ski in/ski out location. Overall, we had a great week. Lauren wasn't too happy with ski school (complaining they skiied too slowly, with some justification, although the instructor claimed she needed more control, which also had some justification), but enjoyed spending the afternoons with us. We self catered, and the big chalet gave room for all the families to get along without being under each others feet. The other families had much younger children, so their skiing was restricted, which made me smile when I set off with Lauren to go skiing - All those years of my friend saying he'd never have kids have come back to haunt him now he has 2 year old twins! Avoriaz has some great, varied skiing, with some really challenging blacks, lots of fun reds and a good variety of blues and greens to please the less experienced. The sun shone (which rather spoilt the skiing in nearby Morzine, where we skiied one day - it's linked by lifts - one minute we were on sheet ice, the next in slush! 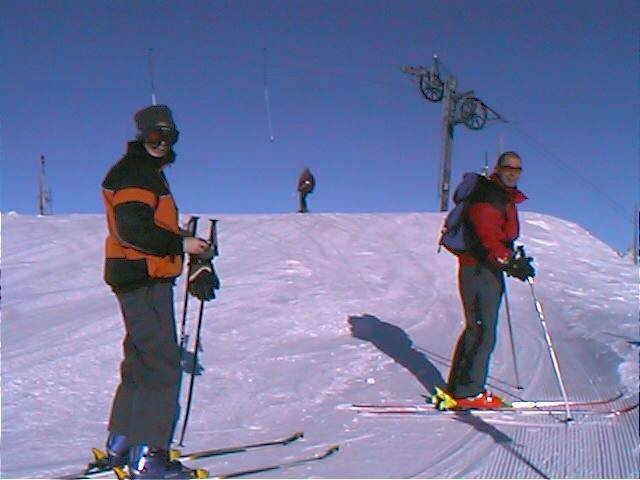 ), which made the Avoriaz slopes a very pleasant place to be and we enjoyed a great week's skiing. 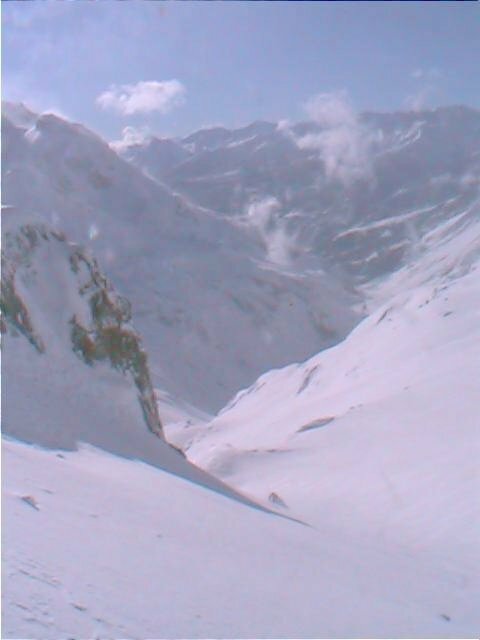 In 2003, we decided very late to go skiing and booked a late trip to Serre Chevalier. As you might have read, we'd been there before and had good skiing. This time our late booking got us a week in a catered chalet, which was a bit of a risk as we didn't know who else would be in the chalet or how we'd get on with them, but it turned out very well. A 3PM flight to Turin meant a very relaxed morning getting ready and heading off to Gatwick. We left right on time and on arrival, luggage didn't take too long and, with the coach leaving quickly, we were in Serre Chevalier at about 7 PM! Our rep kindly sorted out our ski rental for Lauren and we quickly collected them that evening, so that we didn't have to fight the hoards the following day. Our chalet turned out to be a delight. It was positioned on the slop right next to the L'Aravet lift, so it was possible to ski to and from the chalet. Everyone there, like us, had booked late, so were mainly in groups of 3s or 4s. The food, provided by our chalet staff, was good and the company also. For a mixed group, mainly younger, but one 60-odd man alone, we got along remarkable well, with everyone taking their turn to buy crates of beer (including the staff!) to share and various people providing videos for us all to watch in the evening. 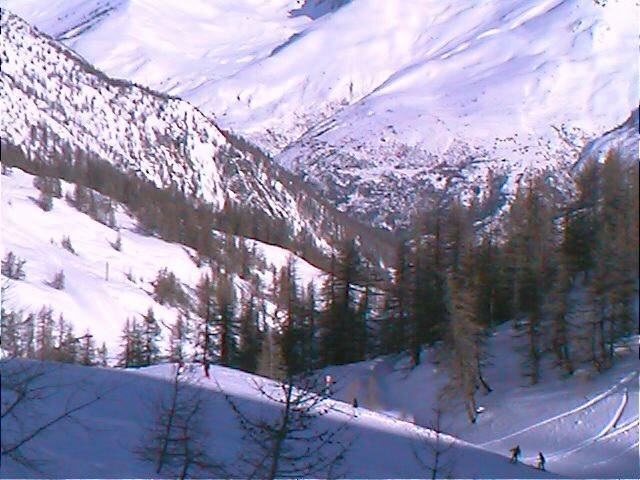 Out on the piste, Serre Chevalier, once again, did us proud. Maybe we are lucky or maybe people just overlook this area because, for France, it is low, but every time we've been there the conditions have been incredible. Once again, we found waist deep powder on the many, easily accessible off-piste runs to play in and the conditions were excellent on piste all week. Lauren joined the ESF and we were slightly amazed to find her instructor was the same Swedish woman who had given her private lessons back in 1997! Lauren did very well, being the only one to reach the required standard of her class and was, by now, able to ski with Mandy and I without slowing us down considerably. One night we ate out at the Pizzeria across from the L'Aravet lift and the food was very good and reasonably priced. I would recommend Serre Chevalier to anyone who cares to listen, but I notice that sort of look I get when someone tells me I really must visit New York come across faces when I do. Most have never been to Serre Chevalier, but wouldn't dream of swapping Val D'Isere for the small, low resort, but having been to both, I would say that Serre Che is considerably more enjoyable as a resort.